It doesn't get cold enough here to give me cabin fever, but we have had a very rainy and blustery week, that has me limiting my outside time. A sure cure for the inside blahs is a bowl of soup with a tropical vibe, like this recipe for Shrimp and Coconut Milk from The Gourmet Cookbook (checked out of the library to give me some more Ruth Reichl recipes). This is meant to be more of a soupy dish than an actual soup, but I added extra coconut milk and broth and left out the flour. It soups up quite nicely and since it's Super Bowl Sunday, I'd call it a Souper Bowl of tasty soup. My changes to the recipe are noted in red below. Combine shrimp shells, water, and salt in a 3-quart saucepan, bring to a simmer, and simmer until reduced to about 2 cups, 15 to 20 minutes. Pour shrimp broth through a sieve into a large glass measuring cup; discard shells. Meanwhile, combine shrimp, lime juice, and salt to taste in a bowl and refrigerate, covered. Heat oil in a 4-quart heavy saucepan over moderate heat. Add garlic, bell pepper, and onions and cook, stirring occasionally, until softened, about 5 minutes. Add flour and cook, stirring, for 1 minute. Stir in tomatoes, coconut milk, and shrimp broth and simmer, stirring occasionally, until vegetables are soft, 15 to 20 minutes. Drain shrimp, add to saucepan and simmer, stirring occasionally, until just cooked through, 2 to 3 minutes. Season with salt and pepper and sprinkle with scallions and cilantro. (I added extra lime juice to taste.) Serve with rice. Notes/Results: Simple, rich and great flavor from the shrimp stock (although the non-chicken veggie stock and extra lime juice I added helped too). 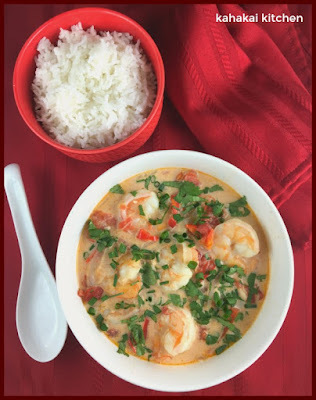 The rice is a must to soak up the creamy coconut milk broth and the the cilantro and green onion add color and flavor. 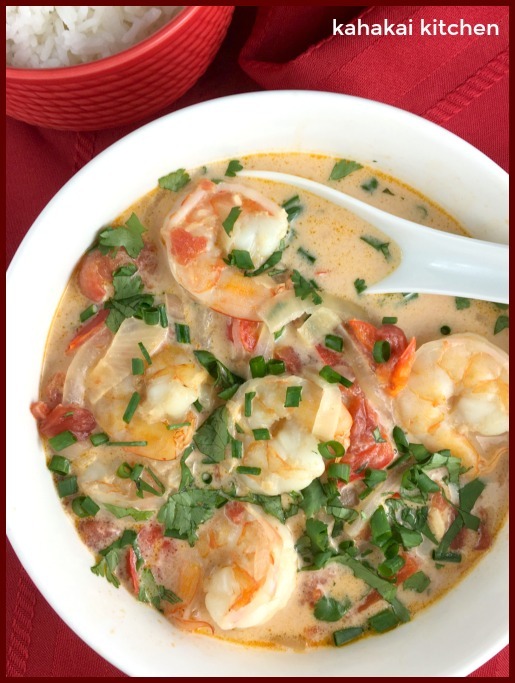 The soup has a couple of extra steps--making the shrimp stock (keep this step for the flavor) and using whole tomatoes, but chopping, de-seeding and draining them (I think you could easily use good diced tomatoes and skip this step with no ill effects). 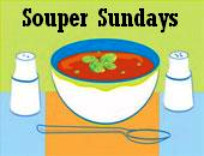 It's cool but sunny today (finally) and this soup made a great Souper Bowl Sunday lunch. I would happily make it again. Linking up to I Heart Cooking Clubs where this week's theme is Cabin Fever--Ruth Reichl recipes to soothe your spirit when you have been cooped up in the cold weather. Debra of Eliot's Eats shared two recipes this week. First is her soupy Instant Pot Anasazi Beans. 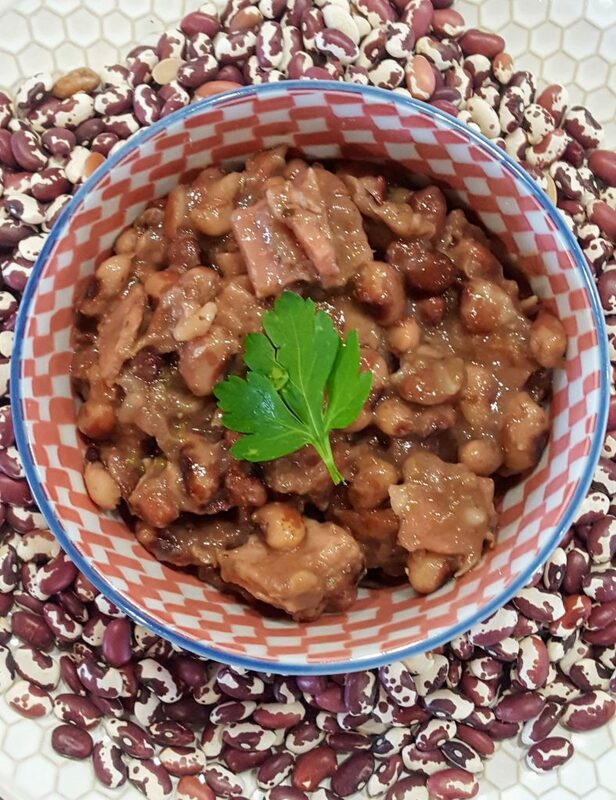 She says, "I had a surplus of Anasazi beans in the pantry and I used some of the roasted green chiles that I have in the freezer along with some long-ago-forgotten frozen ham. Everything else came from the pantry so this was an easy meal. ... These Anasazi beans came from the Taos farmer’s market. It’s a good thing that dried beans virtually last forever because it has been some time since we traveled to New Mexico. The provenance of the beans is what prompted me to throw in the Hatch green chiles." 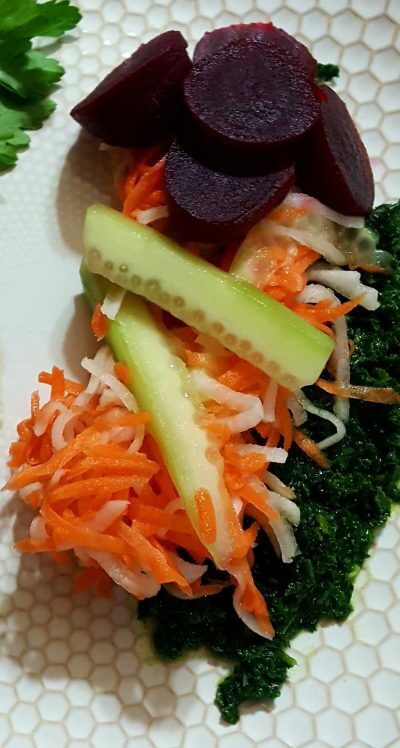 Her next dish is this tasty looking Kula Pickled Beet Salad for our recent Cook the Books book club selection. She said, "I was lazy and shredded my daikon and carrots and just made “sticks” out of the cucumber. Because I had a surplus of jarred pickled beets (more about that later), I just used a premade pickled beet for this recipe. That being said, I do want to try the ginger and lemongrass recipe the next time I harvest beets. I was a little skeptical about the pureed kale. I have to say that the smear of kale made this salad!" 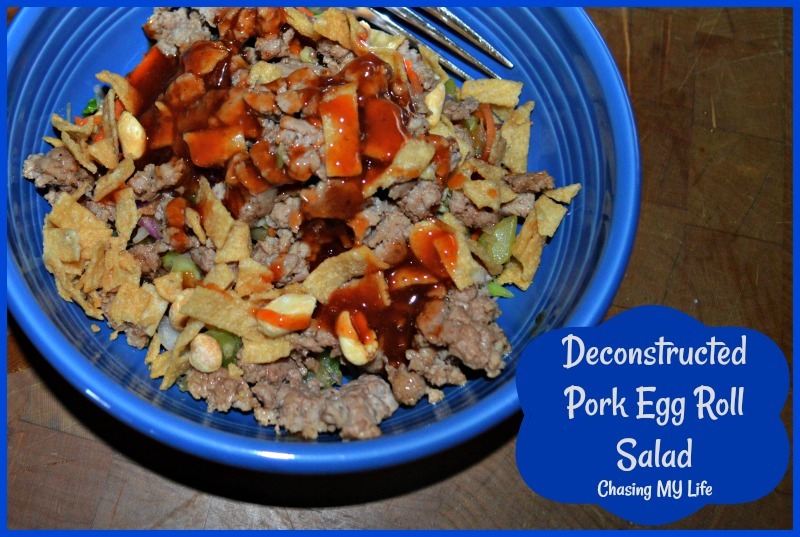 QuiltLady of Chasing My Life is here with a Deconstructed Pork Egg Roll Salad that takes a classic Asian-style appetizer and puts it into salad form. Ponzu sauce and crispy wontons top it off. Tina of Squirrel Head Manor shared Grilled Potato Salad and said, "I try some copycat recipes sometimes and this one is inspired from Zoe's Kitchen. Potato salad can make a nice side dish but I don't like the ones that have too much mayonnaise. I saw this grilled version on the menu and thought I had to try it. Looking and tasting the version I was served at Zoe's resulted in a fairly good version, but not an identical knockoff." 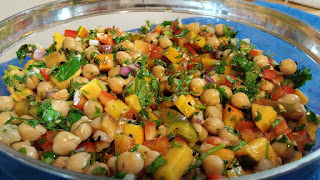 Judee of Gluten Free A-Z Blog brought Moroccan Chickpea and Olive Salad and said, "Chickpea and olive salad is easy to make and absolutely delicious. Moroccan recipes often include a fair amount of olives, and this dish is no exception. This wonderful vegan salad can be made with green and or black olives, chickpeas, and cured lemon with lots of healthy herbs and spices." 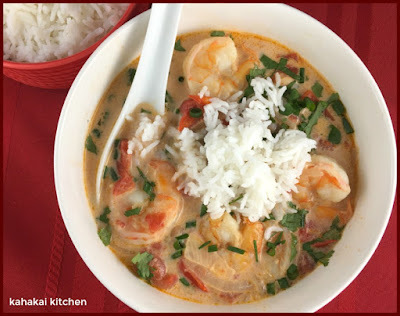 I'm sure lots of Super Bowl fans are in very cold weather and will enjoy this great looking soup! HOpe I'm too late to share! I love how you called it souper bowl! 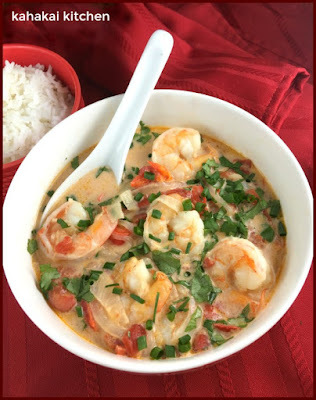 I love the pairing of shrimp with coconut milk, they belong together for sure. Also love the chickpea and olive salad and Tina's grilled tater salad! Both look unique and delicious!